Old Testament - Today in Genesis chapter 23 we read about the burial of Sarah. I think an amazing thing to note in this chapter is that Abraham is determined to bury Sarah in Canaan, based on God's promise (Gen 15:9-21) to Abraham that Canaan would be his and his descendant's homeland. Verse 4 stands out in this chapter and I think can speak for us today as well: "Here I am, a stranger in a foreign land, with no place to bury my wife." We will see this type of phrase throughout the Old Testament - the idea of being an alien and a stranger. 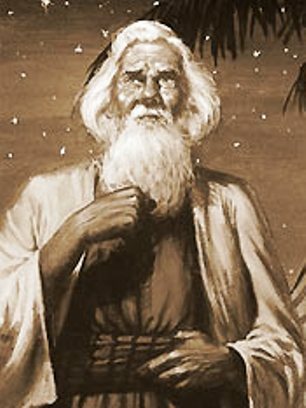 In Abraham's case, he was literally living in a tent - a very temporary structure. But yet, Abraham was confident in God's promise of the Promised Land. And for us today - we are called to be "in the world, but not of the world". In a sense, we are also aliens and strangers. The question we might need to ask ourselves - are we acting like we are aliens and strangers in this world? Are we awaiting our promised land with God in heaven? Or, are we maybe getting a bit too comfortable in this world? And maybe even loving the material things of this world - more than eternal things? And maybe are we forgetting sometimes about the amazing promised land God has in store for us? 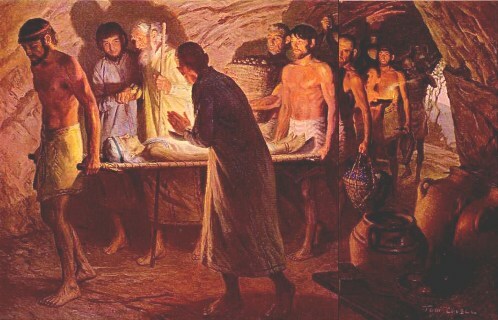 Below is a painting by American artist Tom Lovell from 1967 titled "The Burial of Sarah" that I think corresponds nicely with verse 19: "So Abraham buried Sarah there in Canaan, in the cave of Machpelah, near Mamre, which is at Hebron." Bible.org's commentary on today's readings in Genesis chapter 24 titled "Dealing with Death" is at this link and commentary on chapter 25 titled "How to Find a Godly Wife" is at this link. 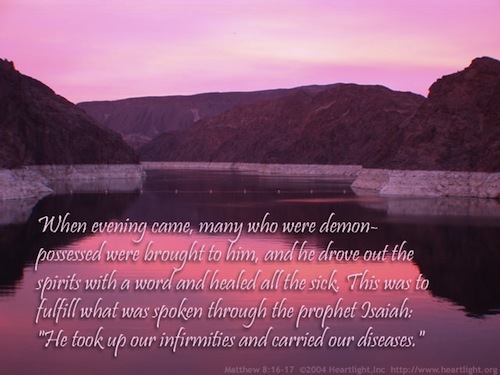 New Testament - Today we read Matthew chapter 8, which is an amazing look at Jesus' healing ministry. While we do read about someone with leprosy, and a paralyzed man, and others with sicknesses and demons - don't we all need some sort of healing in our lives today? 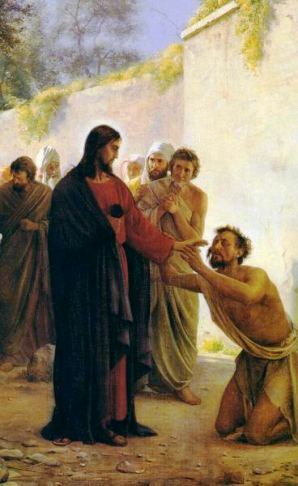 Maybe we can learn something from the man with leprosy in verse 2: "Suddenly, a man with leprosy approached Jesus. He knelt before him, worshiping. "Lord," the man said, "if you want to, you can make me well again." Do we have this kind of faith? Do we believe that Jesus can heal us of what is ailing us? Again, I don't mean just sicknesses - but addictions, and dependencies, and bad habits, and sins? Do you believe that Jesus can make you well again? Will you kneel before Jesus, worship Jesus, and ask for healing? I will give a caveat here - I do know people that have prayed for healing from various sicknesses and diseases - and it has not always been healed. Please don't see this as any shortcoming in your faith - or in Jesus' power. Oftentimes God's ways are much more of a mystery than we can comprehend on this side of heaven. "For now, we see in part. 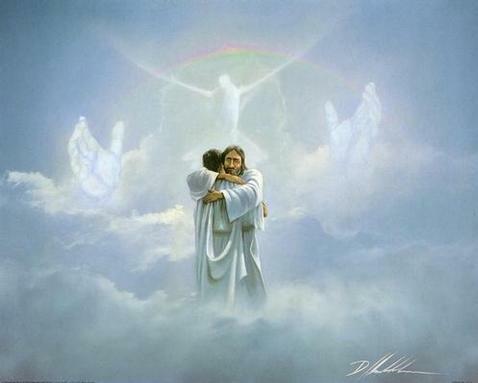 But, then - in heaven - we will see in full." (my paraphrase of Paul’s words in 1 Corinthians 13:12) Please don't give up on God or Jesus if the healing is not coming as you'd prayed for it to. Ultimately, all who have faith in the born, crucified, and risen Jesus will have perfected bodies in heaven. Please stay focused on this "hope of glory", as Paul also wrote about. The passages on the faith of the centurion are powerful - especially his words in verse 8: "Just say the word from where you are, and my servant will be healed!" Verses 10 & 11 are significant to Matthew's primarily Jewish audience of this gospel: "When Jesus heard this, he was amazed. Turning to the crowd, he said, "I tell you the truth, I haven't seen faith like this in all the land of Israel! And I tell you this, that many Gentiles will come from all over the world and sit down with Abraham, Isaac, and Jacob at the feast in the Kingdom of Heaven." Jesus is making it clear that heaven will not be just for Jews, but will be made available for all who come to believe in Jesus as Messiah and in his life, his death for the forgiveness of sins, and his resurrection. Can we learn something from the faith of the centurion in our lives today? Bible.org's commentary on our readings today in Matthew chapter 8 titled "Speak the Word Only" is at this link. Psalms - Psalm 9 verse 18 is so true and powerful: "For the needy will not be forgotten forever; the hopes of the poor will not always be crushed." This is a great reminder that God's heart is for the poor in this world! 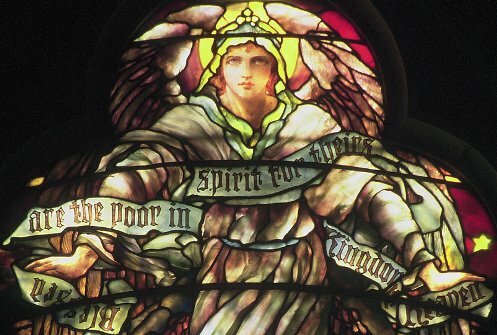 If God's heart is for the poor - should our heart be for the poor too? How is your heart for the poor these days? How do you remember the poor and their hopes? Proverbs - Proverbs 3:1-6 today mentions the "heart" 3 times. I think this is significant! Our hearts - and the state of our hearts are of utmost importance. 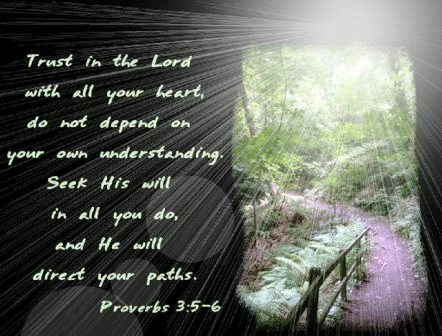 Proverbs 3:5-6 is a verse I have committed to memory and repeat to myself often. It is a beautiful verse to meditate upon. I'll share it with you in the NIV version that I have it memorized in: "Trust in the LORD with all your heart and lean not on your own understanding; in all your ways acknowledge Him, and He will make your paths straight." Will you join me in memorizing these 2 verses? I do believe they will bless you immensely whenever you are feeling worried or anxious about anything in life. Worship God: Psalm 9:18 today reminded me of this great video below set to the amazing Sara Groves song "Add to the Beauty." This video shows the urgent work of Blood:Water Mission, an organization drilling wells in Africa. (among other important work) The band Jars of Clay are very involved in this great organizaton. Please take a few minutes to watch this video and then explore www.bloodwatermission.com. Do you know our God of Beauty? Click here and add to the Beauty! Prayer Point: Pray that you would indeed trust God will all of your heart. Pray that you won't lean on your own understanding. Pray that you will acknowledge God in all that you do. And pray and trust that God will lead you down straight paths as you follow Jesus. 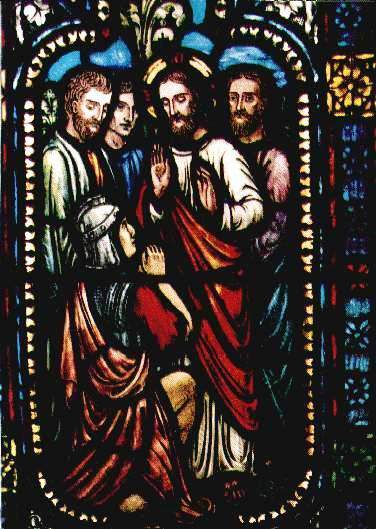 Comments from You and Questions of the Day: Based on our Matthew readings today about Jesus' healings - do you believe that Jesus still heals people today? What does he heal people of today? Does he heal sickness? Addictions? Laziness? Pride? All manner of sins? Has Jesus healed you of anything? Do you believe He can? Also, what verses or insights stand out to you in today's readings? Please post up by clicking on the "Comments" link below! Isaac is now 37 years old (Sarah had him at 90 -Gen 17:17). Abraham is known as and was called, God’s friend (James 2:23). I’m going to assume not only did Abraham speak to Sarah about a wife for Isaac, but he also spoke to God as His friend. Friends have this habit of knowing everything about each other. In fact, a friend, a true friend, is someone who knows everything about you and still likes you. 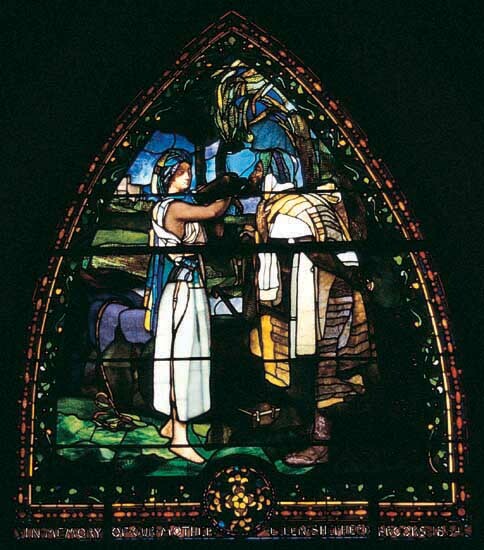 More than likely Abraham saw the type of woman that lived in the area and judged them unacceptable. He probably had been talking to God about this state of affairs for a while. And if we remember in our previous readings, we are told that Abraham received news from afar regarding his brother and his brother’s children (Gen 22:20-24). We were set up by God in the previous chapter to here and receive this information about Bethuel and his family just as Abraham was set up to send his servant to look for Rebekah. It has just came to my mind while typing this out that Abraham may have known that Isaac was to marry Rebekah, by the Word of his friend, God. The entire scenario may have needed to be played out for those involved in God’s set-up, Bethuel’s family and Abraham’s household servant, and more importantly Isaac, and possibly us to show the power of God and that his will comes to pass no matter how hard we oppose Him.. The 10th chapter of 1st Corinthians states that the Old Testament was written to be an example for us (1 Cor 10:5;11) as admonishments and examples. “Singing Opera is like prayer. It is more about listening than speaking,” She said as I almost fell out of my seat. I heard a minister talk about the death of her husband from Cancer, which she had been healed from herself, third stage cervical cancer... She talked about struggling with and raging to God, asking God was He still up there? Her answer was, "I did heal him, but I healed him my way not yours." She called it the "Other Miracle." The Miracle that kept her sane, the miracle that stopped her from blowing her brains out from despair, the miracle that kept her from drowning her sorrow in alcohol and drugs. I've never forgotten the word she delivered and strive to always find the "Other" miracle in things that appear to be tragic. Sometimes we need another perspective, God’s perspective. God does heal, but He does it His way not ours. Sometimes our way is lined up with His way. "Please don't give up on >> if the healing is not coming as you'd prayed for it to."